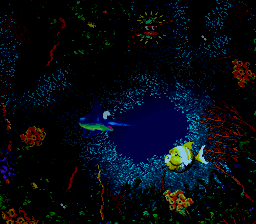 Floodlit Fish is the twenty-eighth level in Donkey Kong Country 3: Dixie Kong's Double Trouble! It is also the third area of Razor Ridge. Much like Glimmer's Galleon in Donkey Kong Country 2: Diddy's Kong Quest, this underwater level is very dark. However, exclusive to this level are Gleamin' Breams, a type of fish that will briefly illuminate the area when poked. Since Enguarde will be playing most of this level, poking the Gleamin' Breams won't be a problem for him. However, these helpful fish will not appear everywhere in the level, and darkness can strike the level very quickly. Because of this, Enguarde and the Kongs will have to find Gleamin' Breams as soon as possible, or else face getting lost very easily. Bounty Basses, Kocos, and Lurchins can all be found here as well to attack the heroes in the darkness. At the start of the level, the Kongs will swim around the bend and enter an Animal Barrel laid in their path. It will turn them into Enguarde the Swordfish, who will need to light up the area with a Gleamin' Bream to the right and travel through a twisty pathway. After avoiding countless Kocos around him, the fish will find another Gleamin' Bream to the left of the first Lurchin, who can help light up the darkness. Moving forward, Enguarde should head down the narrow passageway and follow a few banana trails to the right. Not following these trails can also take the hero to the letter O. Swimming to the south into the depths of the lake, the swordfish will maneuver around some Lurchins and hit the nearby Gleamin' Bream. Once the area is lit, Enguarde will continue on and swim down a long pathway, with a pair of Lurchins right above him. 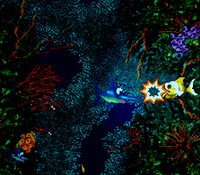 At the bottom of the path, he should move through the rest of the coral reef and travel to the left, entering an area full of dangerous Lurchins. Once he gets out of this part of the level, he will find the Star Barrel, as he nears his way down the path. About halfway into the level, Enguarde will pass a Gleamin' Bream and trudge between the groups of brightly colored coral. He will soon meet some Lurchins in his path, whom he can avoid by swimming into small alcoves on the side of the path. Eventually, the fish will find the letter N and swim to a trail of bananas in the top-left corner of the maze-like area. Curving along the path, he will soon head downwards and dodge a school of Kocos. After passing a DK Barrel, Enguarde will head south again between two pairs of Lurchins and enter a different area. There, the Animal Friend will make his way around another bend and continue moving south, surrounded by countless numbers of Lurchins. Hovering downwards in a straight pathway, the fish will avoid more Lurchins with the use of small alcoves and soon find a fork in the road. Both ways will take him through a U shaped road, though the left passage will have the letter G in it. Falling south at the meeting of these two paths, Enguarde will soon find himself maneuvering around many Lurchins, still trying to move downwards. Eventually, he will enter a safe area and pass a No Animal Sign, which will turn him back into the Kongs. After that, the monkeys will need to swim into a small cave. In this cave, they will blast through a Barrel Cannon to land near a flagpole. Raising the flag on the pole will end the level. Just before the flagpole, the Kongs will find the Koin with his DK Coin. The foe will be able to dodge many of the heroes' attacks with his shield, keeping them away from claiming the DK Coin. So, the monkeys will need to pick up a nearby steel barrel and throw it at a wall, while standing on the enemy. The barrel will bounce back and hit the Koin, defeating him and giving the apes the DK Coin. K: The first Bounty Bass encountered will yield the "K" Letter upon being defeated. O: At a fork in the path shortly after a Gleamin' Bream, Enguarde should proceed left and down. N: Found past some pairs of Lurchin. G: At a later point in the level, the route forward will split into three paths; The "G" Letter is found by taking the left one. A little bit after the letter O, the heroes will pass a Gleamin' Bream and move downwards through the dark pathway. With two Lurchins on their tails, right above them, they will meet some Kocos on their way down. They should swim to the east at the sight of the third Koco and find a Bonus Barrel. It will take them to a Bonus Level, where they will need to travel through an area shaped like a plus sign, collecting many stars. Once all the stars are found, a Bonus Coin will appear at the end of the stage. Just before the letter G, the heroes will head downwards, surrounded by three pairs of Lurchins. Once they get to the bottom of this area, they should maneuver under a fourth set of Lurchins to find a hidden Bonus Barrel. It will lead them to a Bonus Level, where they will need to swim through a dark pathway, collecting forty stars. Once all the stars are collected, the Bonus Coin will appear at the end of the stage. In the Game Boy Advance version of Donkey Kong Country 3, it is possible to get through the level without hitting a Gleamin' Bream even once, due to the increased brightness in the port. This page was last edited on April 10, 2019, at 13:41.